The most important question you must consider when playing any Morris game, is who was Morris? Now considering it dates back to… God knows when and God knows where, this could be very hard to discover and for more information on this one should view our earlier post here! I like to think Morris was a man who discovered this game while playing Tic Tac Toe drunk…Or high on opium, maybe? If it was first played in China? but I’ll let you formulate your own ideas! I made this myself in the same way I made (and on the back of) my Fanorona board which you can see here and also see the technique for making one. Aside from that, versions are expensive and difficult to come by. So when you have a piece of wood, the tools and the know-how, just make one! Now there are different versions of Three Men’s Morris but one of them is exactly the same as Tic Tac Toe, So I made the one that wasn’t (for obvious reasons). Quite possibly the shortest game I have ever played taking literally about a minute to play (like Tic Tac Toe) and coming to an immediate win, lose or draw! However even the version I created, which lacked the diagonals of Tic Tac Toe could still just as easily by played on paper because there is no movement phase like in Nine and Twelve Men’s Morris. So is it worth spending an hour branding a game board for it? Probably not, just variate your games of Tic Tac Toe every once in a while. Three in a row, just like Tic Tac Toe! This is a game that is much more complex and I’me much happier I went to the effort to make a board for it. With all of the aspects of Nine Men’s Morris but even more to think about (as you have more pieces and diagonals to consider) it can be a quite challenging game. 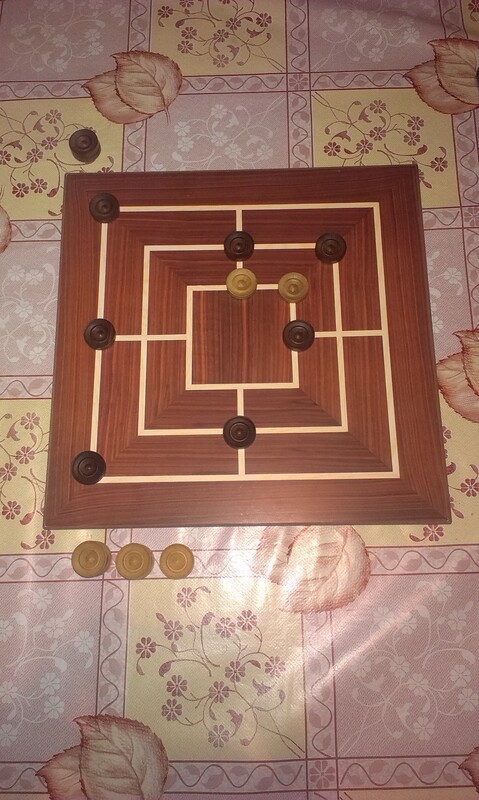 It is played exactly the same as the Nine Men version but with Twelve pieces and a board with diagonals on it. So, you could just draw diagonals onto your Nine Men’s board, or even imagine them! But why do that when you can spend hours with a soldering iron? A game in mid swing. I would recommend anyone who’s a fan of Nine Men’s Morris to give this ago or even a fan of Chess or Droughts. Additionally if you don’t want to buy a physically version HERE is a website where you can play all the different versions of all the Morris games either against a computer or a human. Or if you want an excuse to buy a video game under the premise that it has some educational value or at least some strategic thinking value the Morris game in various forms can be found in both Assassins Creed III and Assassins Creed IV: Black Flag so buy them now! To anyone who cares we ordered the first real print of our very own board game Breach The Keep which you can find more information on here. Hopefully they’re going to look great, they’re being printed in the US and shipped to the UK (because for some insane reason that’s cheaper than just printing them in the UK. So expect pictures and an update on the free games give away some time soon. If all goes to plan the game should be ready to go in less than two months! But we all know life never goes to plan. Additionally we’re also planning a video blog to go alongside/be part of this blog. We’re just contemplating structure and formatting and getting hold of equipment etc. But that could happen anytime soon so keep an eye out for that too! A Fairly Quick Game – Nine Men’s Morris! Having taken a quick break from this chain of posts to write about Elixir, I’m back on fast games! This one’s all about Nine Men’s Morris. Another very old game, a board for which was found cut into a wall in the temple at Kurna, Egypt, that dates back to 1440 BC (although there is doubt as to whether this is an accurate dating of the carving as Coptic crosses were also found carved here that could not have been put there by the Egyptians at the time). Anyone who’s played Assassins Creed III might be familiar with this game – it’s one of the mini games available within the game. Variations of it are also Three Men’s, Six Men’s and Twelve Men’s Morris. Unfortunately, we don’t yet have copies of the others, so this post will mainly (but with some references to the others) be focused on Nine Men’s Morris. A Nine Men’s Morris board and pieces before a game begins. 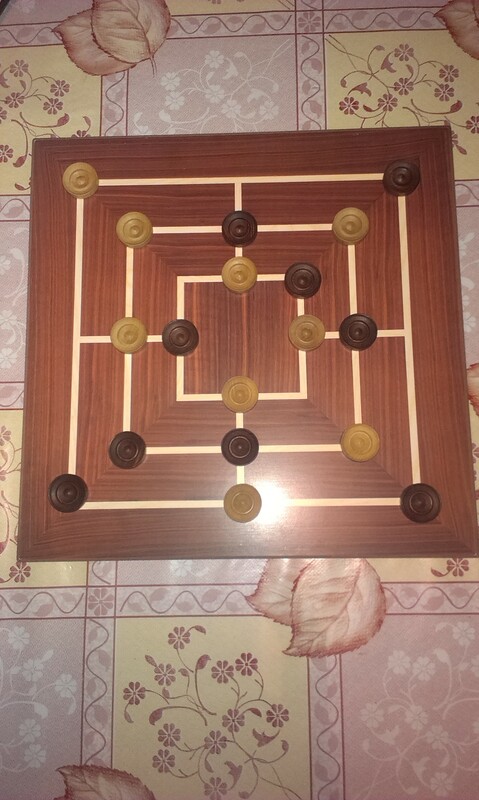 It’s a very easy game to learn, each player has 12 pieces in either black or white. 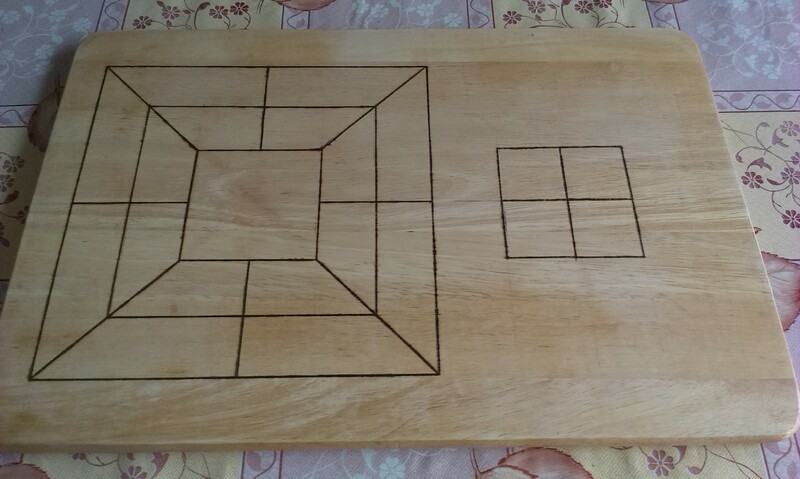 The board is comprised of three squares inside each other, each with intersecting lines midway down each side. White plays first and you take it in turns to place pieces on the corners of the squares or the midway points created by the intersecting lines. The objective is to create lines of three, either horizontally or vertically, called mills. Once a player has created a mill they are then allowed to remove one of their opponents pieces from the board. If a mill is created whilst players are placing their pieces the player who created it is still allowed to remove one of their opponents pieces. 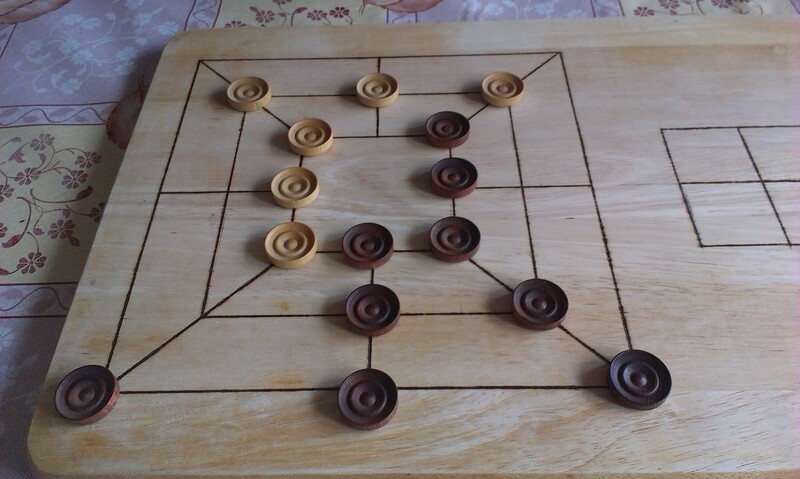 A game where all the pieces have been placed just before the moving phase begins. After all the pieces have been placed players take it in turns to move. Each turn you may move one piece one space. You cannot move, or create mills on, the diagonals. A player who has achieved a mill or two when placing their pieces is going to be in a stronger starting position than their opponent, as they will have more pieces left to manoeuvre round the board. When a player has lost so many pieces that they have three or less pieces left on the board they are then able to move their pieces anywhere. They are no longer restricted to moving one piece one space. They can move one piece from any space on the board to any other space. This makes it considerably harder for their opponent to continue to make mills. Once a player has lost all of their pieces, or both agree that a point in the game has been reached where neither player can win, the game ends. The end of the game and black is the winner having reduced white to less than three pieces. These first five points are all about Three Men’s Morris, not Nine! In line for “oldest game in the world” – with Go, Backgammon and Chess. 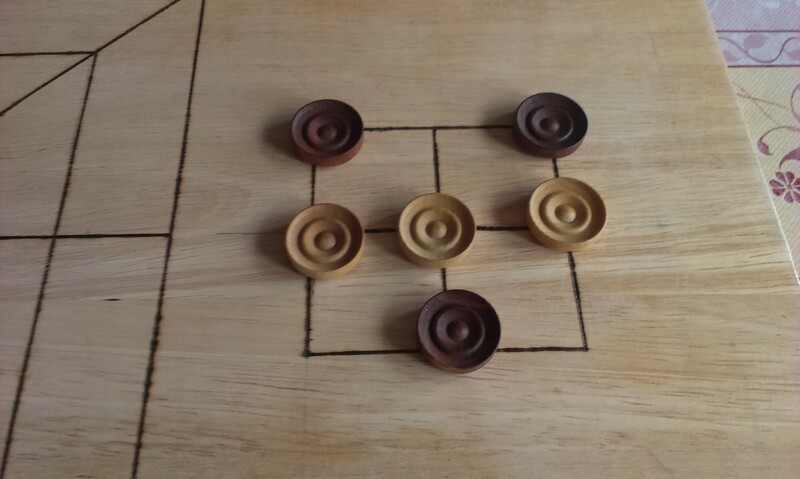 Noughts and Crosses or Tic Tac Toe are the same as the variation of Three Men’s Morris that involves the use of the diagonals for making mills. According to Thomas Hyde the Chinese played it in 500BC. Ovid mentions it in “Ars Amatoria” – the Romans played on wooden or stone boards, although occasionally more exotic materials were used. Three Men’s Morris was widely played in England 1300 AD – boards can be found carved, by monks, into the cloister seats in Norwich, Canterbury, Gloucester and Salisbury Cathedrals, and Westminster Abbey. Other Nine Men’s Morris boards have been found in Ceylon – carved in the reign of Mahadithika Maha-Naga (9-21AD), and European boards have been found in places like the first city of Troy, a Bronze Age burial site in Ireland and at the Acropolis in Athens. The game reached peak popularity in Europe in the fourteenth century. In old England the game was played with black and white pebbles on a board that was drawn out on the village green using a trowel, or drawn onto a pub or tavern table with chalk. Shakespeare references it in A Midsummer Nights Dream in Act II, Scene I – “The Nine Men’s Morris is filled up with mud!” ~Titania – this must be what happened to the boards drawn on the green whenever it rained! 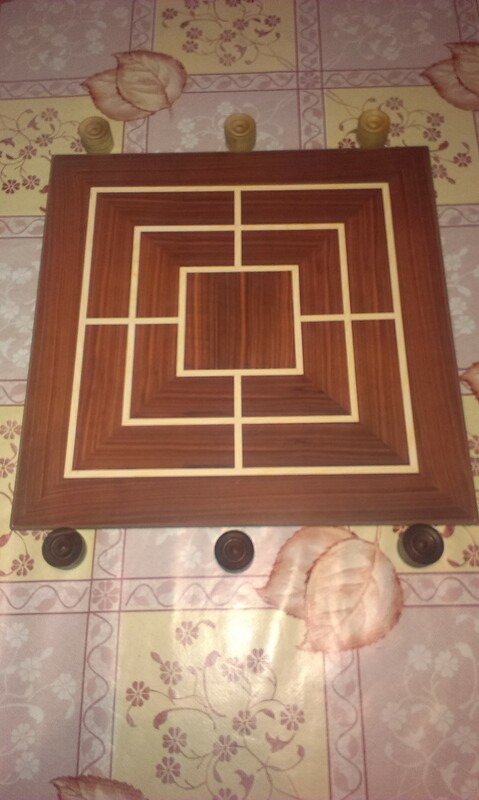 A version of the game called Morabaraba which is played using the diagonals on the board is still very popular, and played to a competitive level, in South Africa. Because the game was popular in Medieval England there has been some speculation as to whether the name “Morris” is related to the English Morris Dance. However, Daniel King says that it is coincidence- the word Morris in this context actually deriving from the Latin “Merellus”, meaning a counter or a game piece. Pretty much everything I’ve put up about the history of the game I found here. But I supplemented some of the points with information from our trusty old friend Wikipedia!